Random Noir's Exclusives @ MM 2019. Thread: Random Noir's Exclusives @ MM 2019. RandomAxe/Scott and I are alway humbled and flattered by the continued popularity of our Custom Mego Meet Exclusives. We continually sell out of them as quickly as we can produce them. Your support means the world to us. We're bringing back what is likely our last batch of The Officially Authorized E-Man Action Figure (with signed certificate of authenticity by co-creator Joe Staton), as well as our Jet Jaguar and Spectreman returning for a short-run encore (with different colour packaging). The BIG news is, rather than just one new offering this year, we're bringing THREE. You've already seen the prototype Ultra7 and Tetsujin Tiger Seven on our table last year, but there is a surprise we'll be unveiling in due time. We'll also have a one-of-a-kind Stealth Suit Tetsujin Tiger Seven that we are donating to the Mego Museum benefit auction. We'll be setting up pre-orders soon for in person pick-up at Mego Meet. We'll post here when we're ready. Most of the heavy lifting production wise is RandomAxe/Scott, but we also need to give HUGE credit to our team of contributors, the Ocean's 11 of Mego Customizers, including megowgsh/Austin, Brazoo/Aaron, ScottA (and his wonderful wife Elaine), LaserMego/Paul, and CrimsonGhost/Andy. These are truly the Best of the Best. BIG Shout out to Cast-a-Way/White Elephant Toyz/David Lee/Gaga4toyz-Jason for the high quality bodes that make our customs incredibly pose-able. My store in the MEGO MALL! BUY THE CAPTAIN CANUCK ACTION FIGURE HERE! Bravo!!! Always a treat perusing the Random Noir table! This year is no different. What a great line up: I'm certain the grouping is a dream come true for many specialized collectors. What truly Amazing professional work here. Be very proud of your team results. I'm always taken with anything that is finished off in a Kresge style packaging. I also forgot to mention the most important member of Team Random Noir. Random Axe/Scott's mom, who helped out with some of the more complex sewing tasks. Thanks friends for your kinds words, and I'm sorry to read in the other thread that our Grizzly Friend from the Eastern Provinces will not be joining us this year. Here is hoping that we can achieve quorum for the Canuck representatives in 2020. All-star efforts have efforts have produced All-Star results. Excellent figures Team Random Noir! I cannot wait to see the new reveal! I post in thy general direction! Those are some beautiful figures, nice job. These are always the best. Great figures and very professional. 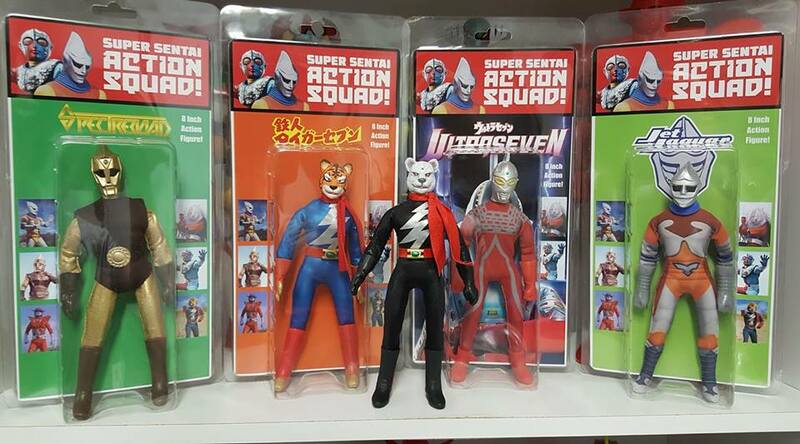 We realize Tetsujin Tiger Seven didn't air on North American TV like the other characdters. Trust Us, he's kind of awesome. Here is the first episode of the TV show with english subtitles. Last edited by samurainoir; Feb 12, '19 at 2:01 AM.